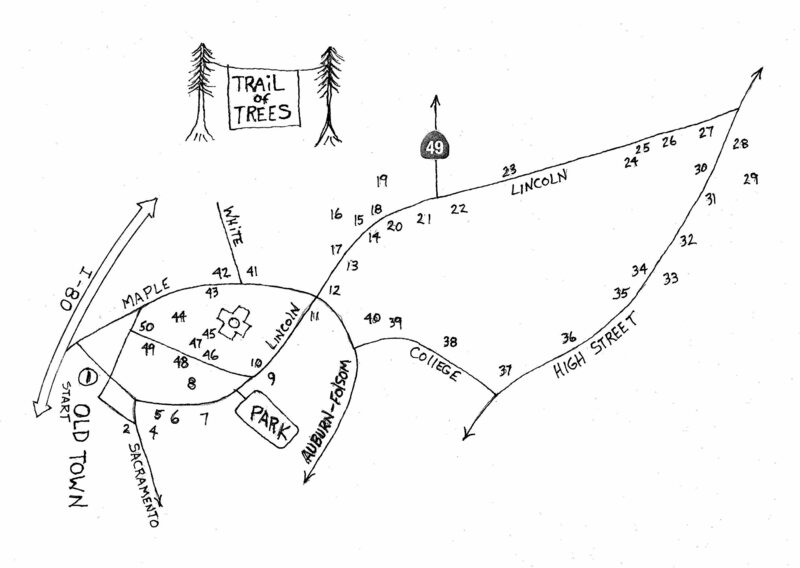 Also known as the “Auburn Trail of Treasured Trees“, this walk is unique and different, and presents a look at the many unusual trees that have been planted around downtown Auburn since its very beginning. The tour was developed by the Auburn Area Urban Forestry Group to recognize and protect trees of interest around Auburn’s downtown area. You can start your walk anywhere around the loop but for description the walk starts at the “Welcome to Auburn” sign in old town at Lincoln Way and Park Street. A beautiful guide brochure is available from AAUFG, PO Box 9283 Auburn, CA 95604 or call 916-782-1011. The trees are numbered along the sidewalk on leaf markers and identified by metal tags on each tree. Total walk is about 1 mile. These trees are from all around the world. The only trees native to Auburn would be number 11, 12, and perhaps 30. The rest are imported. Some of Auburn’s native trees are the Black oaks and Blue oaks, the Canyon and Interior live oaks, the Madrone and Manzanita, the Gray pines (previously known as Digger pine), Ponderosa pines, and the Incense cedar.